Having sampled big city life for a month and dealt with most of 'Sunstone's' immediate needs - including a coat of varnish on the hull - we decided that we would move our base for the remainder of our time in South Africa to somewhere a little smaller and quieter. 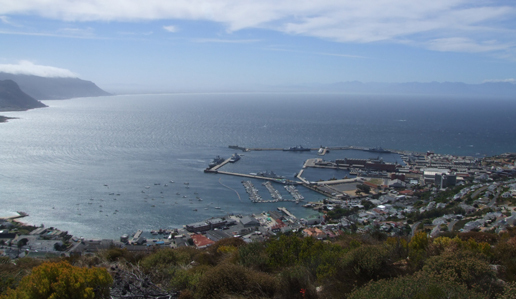 Simon's Town is about 25 miles south of Cape Town on the western side of False Bay. 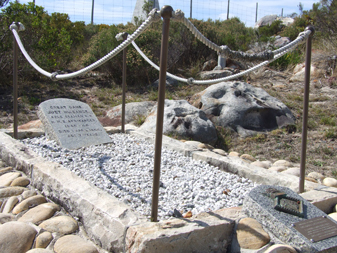 It is best known as a naval base, at one time one of the largest foreign bases for the Royal Navy and now the headquarters for that of South Africa. A longish day sail in beautiful weather took us round the corner, 60 miles by sea, passing the Cape of Good Hope in the process. As so often in the past, our rounding of a great southern cape - our fourth of five - was as pleasant as you could wish, not at all living up to its early name, the Cape of Storms. 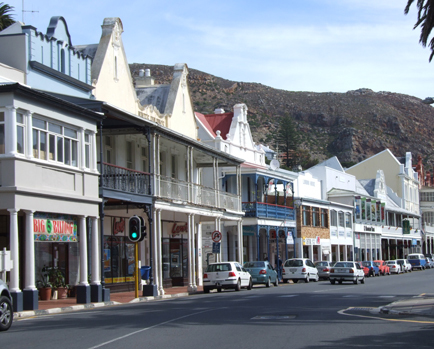 After the bustle, traffic, dirt and potential danger of the Cape Town dock area, it was a pleasant relief to settle into Simon's Town. Though it is something of a day-trip tourist destination during the summer season, it remains pretty quiet, with the kind of strong community life so often seen in smaller towns. 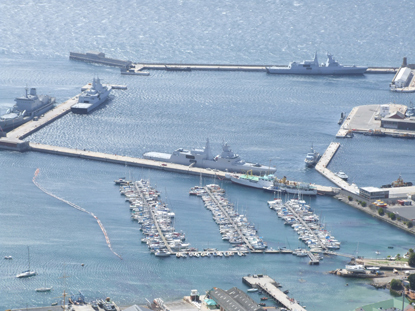 Despite its dominance of the harbour and the economic life of the town, the Navy has less impact socially than you might expect. One of the many advantages of moving to Simon's Town was that it gave us the opportunity for country hiking and biking. One such local hike took us up the 300+ steps to the former signal station at the top of the hill overlooking the harbour. At the top we paid our respects at the grave of Able Seaman Just Nuisance, the only Great Dane ever inducted into the Royal Navy. He was apparently not over-friendly toward officers, but accompanied ratings on leave in town and did his part in keeping local pubs solvent. His drinking habits may have contributed to a relatively short, if happy, life. The Royal Cape Yacht Club had been very welcoming and the staff and members helpful. However, it was a big club where it was not easy to get to know people. In addition, the racing there was inhibited by the difficulty of getting in and out of the marina when the SElies were howling off Table Mountain. By contrast, the False Bay Yacht Club, based at the marina in Simon's Town is small, friendly and has an amazingly comprehensive racing programme. Within days of our arrival we were thoroughly absorbed into the social and competitive life of the Club, either racing with our new friends, Steve and Michelle with their crew on 'Sea Shuttle', or racing 'Sunstone', mostly two-handed. 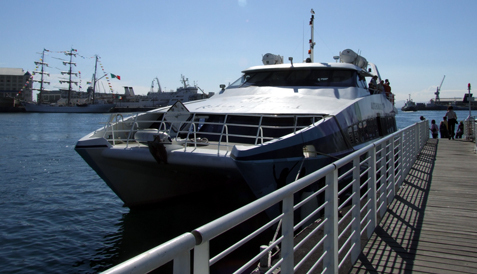 However, the Easter Regatta gave the opportunity to bring the Sea Shuttles aboard 'Sunstone'. Though the first race was plagued by fickle winds, we persevered and managed to get a second place. The next day in brisker winds and with the local knowledge of the two Steves, we managed a first, thus maintaining the reputation of racing houseboats everywhere. Shortly after these racing antics, Tom's sister, Inge joined us, having flown, in her usual thrifty way, on free airmiles all the way from New York. 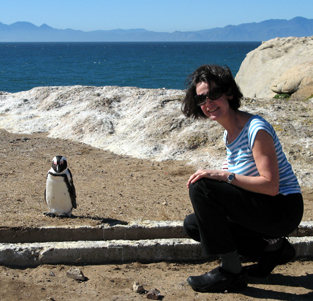 Vicky had arranged a non-stop tourist agenda for her, from the local penguins and the cable car up Table Mountain to the trip to Robben Island to visit the site of the notorious former prison, where Nelson Mandela and many other leaders of the freedom struggle were imprisoned. The guides on the island are mostly former prisoners whose graphic accounts of their treatment there are based on their own experiences. 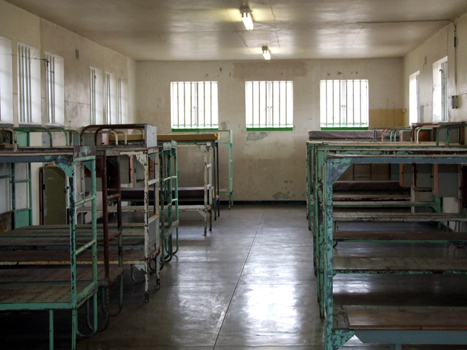 Many of the prisoners were housed in dormitories, while the 'politicals' were mostly kept more isolated in individual cells, like that of Mandela, shown here. 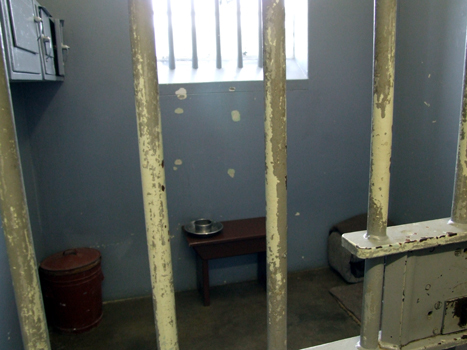 Perhaps the most striking aspect of the account given by our guides was that the more educated prisoners effectively turned the prison into a university, encouraging and enabling those less well educated to improve themselves. It was also interesting to see the contrast in the attitudes of our two guides. One stressed repeatedly the importance of reconciliation between everyone in the new South Africa. The other clearly still harboured deep-seated resentment for his own treatment and that of others during the Apartheid years.